Ok i'm not a fan of romantic comedies. I know that may come as a surprise to the readers of the blog as they perceive me to be a man in touch with my sexuality who isn't afraid to shed manly tears, but that's only during Pixar films, and Armageddon, and the Little Snowman, and Click, and the Hangover part 2 (that was for different reasons, it was just so sad when they killed any semblance of Todd Philip's directing dignity). Anyway, that's a divergence, I mention romantic comedies as that's kind of what this is billed as. Boy meets girl, boy and girl don't like each other that much, boy and girl get to know each other, boy and girl get all lovey dovey, boy does something wrong, delcaration of love, end film, get bonus boyfriend points for watching sappy love film. The difference is that this may be the most realistic portrayal of psychologically damaged individuals that's been put onto screen in a long time. Not since the Hangover Part 2 where we saw a crazed Mike Tyson attempt to mumble words while people sadistically played music behind it. 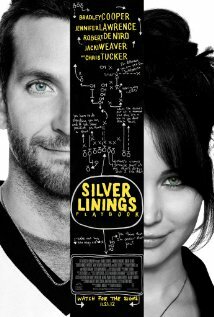 The film follows good old Bradley Cooper, a fella who is a little bit crazy because his wife bonked another fella. The other fella was balding and old and Bradley Cooper is Bradley Cooper so you have to question this person's judgement. After being released from the psych unit for beating down the aforementioned old balding fella Bradley is released back into society. I think the initial scenes in this film so accurately portray how people deal with psych issues that it just made the film great for me. The first 20 minutes before any other love plot kicked in could have been explored for the whole film, but this is Hollywood so at some point we're going to need to have violence or a plot involving lurve, so we got the latter (instead of Silver Linings Make-My-Daybook.... guys? Come back please I'll be good). Jennifer Lawrence has been picking up many an award for her portrayal of a grieving widow here and I must say she deserves all the praise she gets. She plays a broken lady to perfection with the perfect amount of sort of almost keeping it togetherness so that she doesn't start to grate. The interplay with the two characters is what makes this film great, what makes it superb is the entire cast. Due to my not having a heart thing, I very rarely root for the guy to get the girl in these kind of films mainly because who cares? Will their lives now be that much better now that they've told a lady they love them? Why do they need this person's affection when (most of the time) the only true problem in their life is that they don't have someone. That's where this film differs as its not truly about these characters relationships but how the relationships affect the characters themselves. Self reflection is the name of the game and its lovely to see. Plus Breniffer aren't too shabby to look at. All in all a pretty outstanding film and worthy of the heaps of praise that it has been lathered with. I wish that Bradley got more props as this is one of the few roles where he's allowed to show that he may actually be a brilliant actor if his agent would just make him do good movies (go see Place Beyond The Pines and we'll reconvene here next time to talk about it). I give this film a romantic 9 out of 10.